Forgotten your Personalized Party Rosettes? We can help. It is very easy to spend all the time planning the main areas of the event and forget about some of the smaller items that can make the difference. Typically you will have arranged the booking of the venue, the entertainment, any overnight accommodation, and of course the transport to the venue well in advance of the day. But possibly not the smaller party items. It could be an oversight or it might be that you delegated the task to 2 people. The actual purchasing of the items can fall between the two of them. With the result that nothing has actually been done. 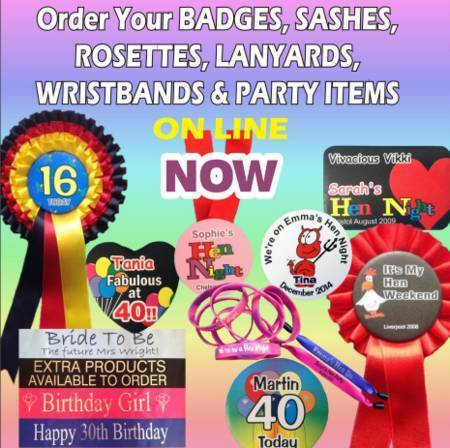 Typically, hen night badges, sashes and rosettes are items that fall in this category. And nowadays they are proving to be an essential part of the hen night. Of course this problem is not just limited to hen night celebrations. It equally applies to stag nights and birthdays. So what can you do if you find yourself in this situation. Well the first thing to say is not to worry. Providing you haven’t left it until literally the last minute then we can usually help with a quick delivery of personalized party rosettes. We make all the personalized party rosettes to order. We also print all the centres ourselves, so we don’t need to wait for a foiling block to be made. All this means that you could order as late as Thursday lunchtime and you could get you order first thing on Friday morning. We can make a rush order (at no extra cost to you). All you have to do is arrange to get the payment to us via our web site or over the phone. Then pay for the extra postage to get a next day delivery. We can also arrange for a Saturday morning delivery. There is a small surcharge that the postal service place on Saturday guaranteed services. 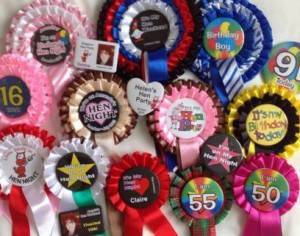 You can order your rosettes, now, by going to our main site party rosettes page.